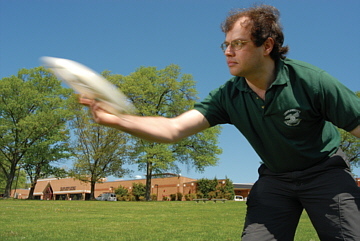 Ralph Lorenz, a scientist at Johns Hopkins Applied Physics Laboratory who works in planetary exploration, is author of Spinning Flight: Dynamics of Frisbees, Boomerangs, Samaras, and Skipping Stones (Springer, 2006). Q: What's the Best Way to Throw a Frisbee? A: "It's a tricky question, in the sense that I could maybe tell you from simulations and experiments that you should throw it with a spin rate of 8.7 revs per second and hold it at an angle of 3.8 degrees above the horizontal, or whatever. But it's a very different thing to actually execute those kinds of numbers because human motor control is not something we can program. So the short answer, in practical terms, is practice.